Staff Sgt. 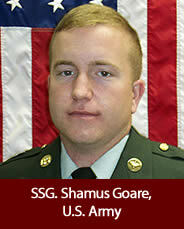 Shamus Goare, U.S. Army, age 29, of Danville, Ohio, died June 28, 2005, when an MH-47 Chinook helicopter crashed while ferrying personnel to a battle against militants in eastern Afghanistan. He was assigned to the 3rd Battalion, 160th Special Operations Aviation Regiment (Airborne), Hunter Army Airfield, Ga.